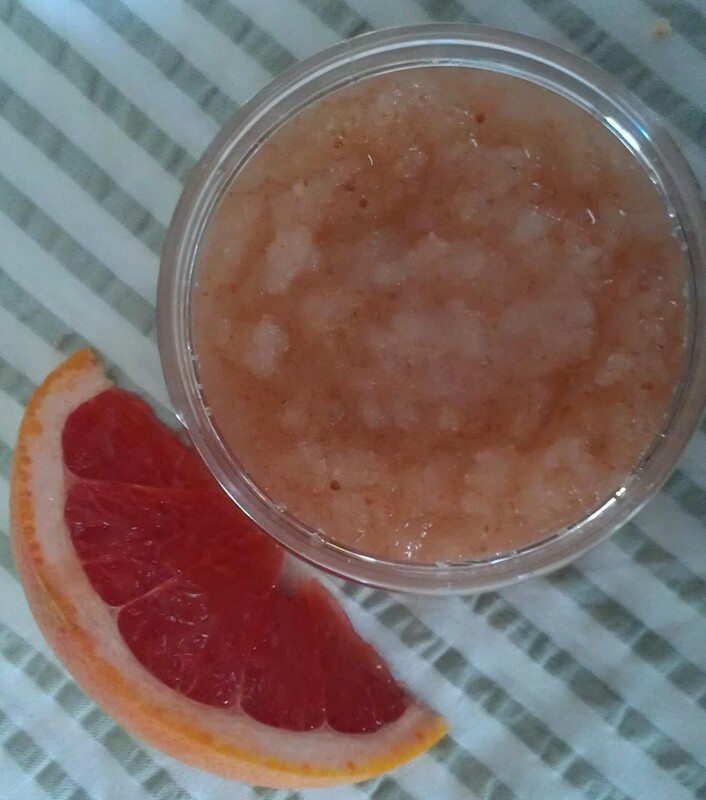 Homemade Pink Grapefruit Aromatherapeutic Body Scrub. Made with coarse pink Himalayan sea salt, fine grained white sea salt, sunflower oil, and pink grapefruit essential oil. Give your friends and loved the ones an awesome homemade gift this holiday season that brings the spa home — i.e., an all-natural body scrub that smells fabulous! Exfoliating scrubs are full of several health and beauty benefits that many people don’t realize. They boost your circulation and also stimulate your lymphatic system, which is especially great this time of year as a way of boosting your immunity naturally. Because dead skin cells get sloughed away when you exfoliate, scrubs also reduce the appearance of fine lines and wrinkles and are sometimes helpful in preventing acne from forming. The oils in them also leave the skin feeling supple and moist. And once you add in essential oils, you have aromatherapeutic benefits, too! Plus, they’re very easy and inexpensive to make. All you need is some oil, salt or sugar, and essential oil — all of which are available at your local natural foods store. Whipping up a batch takes just a few minutes and the best part is that you can then divide it into several jars for gift giving, which makes checking off your list so much easier! Check out how easy it is to whip up an awesome, all-natural body exfoliating scrub. Before getting started, you’ll want a container to put your scrub in. You can use a sterilized left-over glass jar, but do remember it is prone to breakage, especially when handled with wet, slippery hands! Best choice is to use a plastic PET jar like these ones sold here on Amazon. Unlike regular plastic, PET doesn’t react with essential oils, so definitely use this special kind of plastic if you plan on making an aromatherapeutic body scrub. Otherwise, you could get away with a regular plastic container if you leave the essential oils out. PET jars usually cost a little over $2 a jar and are sold in multi-packs of four, six, and more. Perfect for creating multiple scrubs! (1) Fill your container with some salt or Turbinado sugar. But don’t fill it all the way. You need to leave some room to add the oil and optional ingredients, such as Vitamin E as a natural antioxidant (if you so desire). After eye-balling it to make sure you got the amount of salt or sugar about right, then pour it into a bowl. Break up any clumps with a spoon. For an 8 oz. scrub, I usually use about 6 oz. + 2 tablespoons of sugar or salt. You can use a fine grain sea salt or a larger grain salt, such as Dead Sea salt, Epsom salt, or Himalayan salt. Really any salt works well, but some salts do have their advantages over others. For example, Dead Sea salt has a range or minerals in it, whereas Epsom salt is basically just sulfate and the mineral magnesium. Also, the finer the grain, the gentler it is on your skin. For the pink grapefruit scrub featured above, I used a combination of a coarse-grained, pink Himalayan sea salt and fine-grained, white sea salt (about half of each). Sometimes sugar is nicer in scrubs for those who intend to use them on their legs, especially after shaving; they won’t burn like a salt scrub will. Plus, they do lend a sweet smell to the scrub. (2) Cover the salt or sugar with oil. Blend well. I add about 1/2 cup when making an 8 oz. scrub. My preferred oils to use are organic sunflower or almond oil. Both are very mildly scented, great for the skin, and absorb well. Olive oil is also great, but it’s a little thicker and sometimes has that distinctive scent that some may not enjoy as much. (But I love it when making a “Mediterranean” styled scrub with rosemary essential oil, though!) Avoid canola oil. (3) Mix in essential oils. One of the most common essential oils used is lavender and it’s a great one to try if you’re just starting out with essential oils. It can also be blended easily with other oils, such as orange or bergamot. Other good scents to try that are especially festive for the holiday season are pink grapefruit (which is what I used for the scrub featured in the photo above), rosemary, and peppermint (see “DIY Peppermint Candy Cane Body Scrub“). I usually use about 48 drops of essential oil per 8 oz. of scrub, but I may lessen that amount by one-half or even two-thirds if I’m making the scrub for an elderly person or a child — or if I’m using essential oils where less really is “more,” such as peppermint. Also, if I’m adding essential oils that aren’t typically used for skin care, such as cassia (from cinnamon bark), I may only add a couple of drops and round that out by using other oils that are well suited for skin care. Whenever in doubt about which essential oils to use, my advice is to use a trusted source or to consult an aromatherapy book to make sure the ones you’re considering are appropriate for skin care. A few of my favorite aromatherapy books are Aromatherapy For Dummies by Kathi Keville, The Complete Guide to Aromatherapy by Salvatore Battaglia, and The Art of Aromatherapy: The Healing and Beautifying Properties of the Essential Oils of Flowers and Herbs by Robert Tisserand. (4) If you’d like to add some natural antioxidants and preservatives to your body scrub, there are some great options. You may add in some Vitamin E for a natural antioxidant. Simply break open a few capsules of Vitamin E (up to 2 tsp.) and mix it in. To extend the shelf life of your scrub even further, grapefruit seed extract (use about 1/4 teaspoon), which is usually available at most natural grocery stores, and rosemary oleoresin extract (about 7 drops), which you usually need to order on-line from places, such as Amazon, are great options as natural preservatives for your scrub. Finally, just so you know, exfoliation should be avoided if someone has certain health conditions, such as deep vein thombrosis, varicose veins, psoriasis, eczema, or is sick with a fever. So, modify the caution statement as needed if you think any of the above conditions are relevant. I hope you try whipping up some homemade exfoliating scrubs this holiday season. They really do make impressive gifts and they’re fun to make! They’re also a great activity to do with kids or teens. 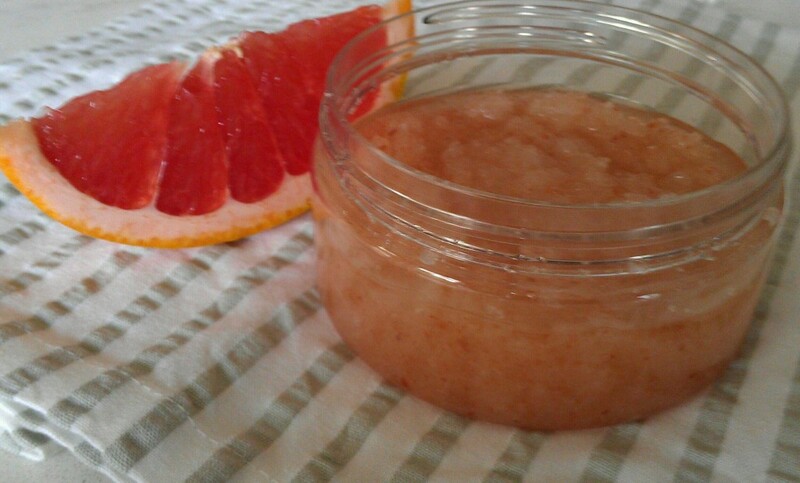 This homemade body scrub made with pink grapefruit essential and other natural ingredients smells delightful and can be enjoyed by men, women, and children alike. How delightful. I would never think of creating my own exfoliating essential oils scrub. I can almost smell it and feel it now. You have inspired me to create one when I have a spare moment and try it on myself. Thanks for explaining in detail just how to do it. I can smell it through my computer :). I love grapefruit and this sounds awesome. This is a great post! You’ve totally demystified a scrub. I had no idea how to make one! Adair @ Lentil Breakdown recently posted…Happy Farm-to-table Holidays! Oh how I love homemade scrubs. We also love to do homemade bath bombs because you can really customize them to what you need. Great post and directions!